Everything except the glitter is from Stampin' Up! This is a card that I made as a sample for one of the lessons in the nine week course I'll be teaching soon. 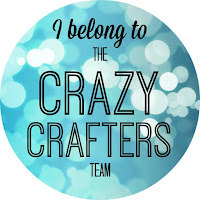 It uses die cutting and embossing using the Big Shot and a fun but messy technique with glitter! 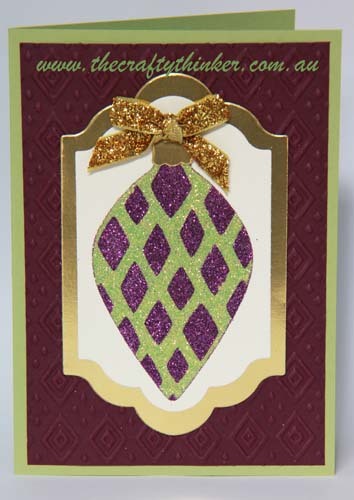 To create the glittery ornament I first die cut a piece of double sided adhesive Jac paper using the Delicate Ornaments Thinlits Dies. Having adhered one side to my label, I then peeled off the protective backing to reveal the sticky film. I put a little soap onto the back of my stencil (in this case I used one of the Happy Patterns stencils) and placed it - soap side down - onto the sticky die cut (the soap is to make it easy to remove again). Next I sprinkled on my first colour of glitter (in this case purple). I rubbed it in well (burnished it) with my finger before removing all the excess glitter with a large, soft brush. It's important to use ultra fine glitter for this technique. The next step was to carefully remove the stencil, revealing the remaining sticky parts, which I then coated with the second colour of glitter (green) and rubbed in with my finger. Don't worry - if you're careful to remove all the excess glitter, you won't up end up with contaminated glitter. The last step was to add the little ornament top and a bow using the new glitter ribbon. Here's another card I made using this glitter technique but this time I used one of the dies from the Delicate Ornaments set as the stencil. 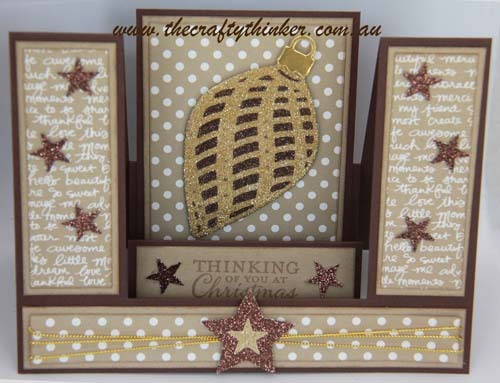 The sentiment is from the matching Embellished Ornaments stamp set (available as a bundle with a saving of 15%).